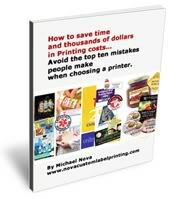 Avoid The Top Ten Mistakes People Make When Choosing a Printing Company. How cleverly packaged “special deals” can actually prevent you from receiving what you really want, and cost you more than you expect.. This report will come to your email box in a 5- part series of easy to read text formatted emails, absolutely 100% free as our way of saying thanks for stopping by. Please do sign up, because this is important information that you need to have… When I started in the business, I didn’t know any of this. Now I’m sharing this inside information with you.